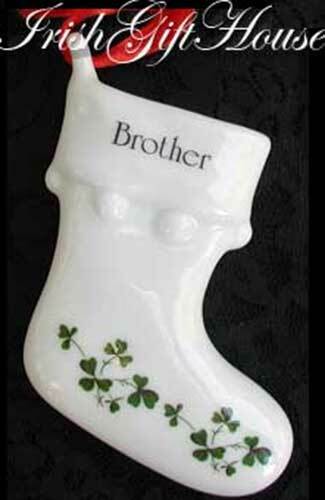 This Irish Christmas ornament features a dimensional porcelain stocking for brother. The Irish brother ornament is decorated with shamrocks on both sides and the hollow design will hold a miniature gift. The Irish stocking ornament measures 3" tall; it is gift boxed with a shamrock history card, complements of The Irish Gift House.